What If I Owe the IRS? 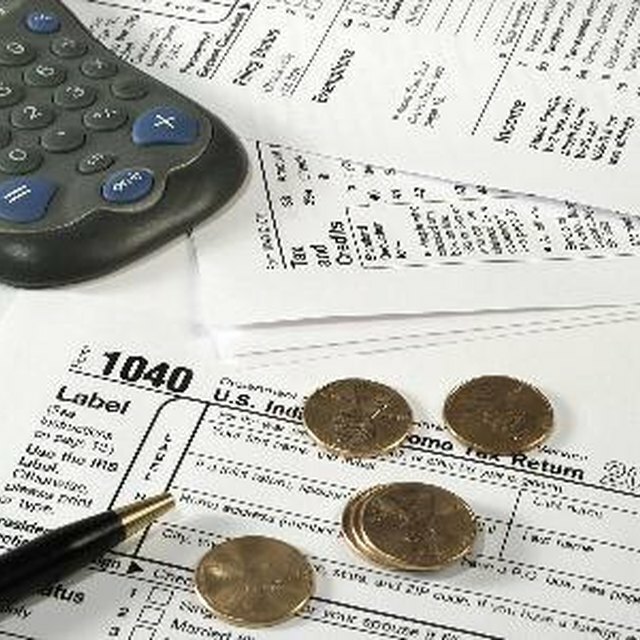 Internal Revenue Service rules say you must report untaxed income from any source. This includes income from self-employment, investments, lottery winnings, alimony and capital gains for which you receive a Form 1099. As of 2015, if you expect to owe tax of $1,000 or more on the amount, you cannot wait until year’s end to pay any income tax due. Instead, you must estimate the income tax due each quarter and file a quarterly tax return. If you do not pay the correct amount of income tax in any single period, the IRS may charge penalties and interest even if you qualify for a refund when you file your annual return. To help prevent mistakes or incorrect estimates, consider hiring a tax professional to help calculate your taxes. Use the IRS Form 1040-ES estimated tax worksheet, the current year’s tax rate schedules and your tax return for the previous year to estimate your adjusted gross income for the coming year. In addition, you’ll need to review the “What’s New” section of IRS Publication 505 to make sure that estimated payments reflect the most current tax laws. The forms you need are available from the IRS website, your local IRS office or by calling 1-800-829-3676. Once you finish, divide your estimated annual gross income by four to estimate quarterly tax payments and keep the worksheet for your records. At year’s end, you’ll note these payments on your annual tax return. Quarterly tax payments are usually due on the 15th of the month following the end of a quarter. For example, quarterly taxes are due on April 15 for untaxed income you received between January 1 and March 31. The only exception is if the 15th falls on a weekend or a federal holiday. In this case, the due date becomes the following business day. Pay each installment online, by telephone or mail payments so that the postmark is on or before the payment due date to avoid interest penalties for filing late and for the overdue amount. If you mail in a payment, refer to instructions on IRS Form 1040-ES for the correct address. Include a 1040-ES payment voucher and a check or money order payable to the United States Treasury. Although you can use a third-party payment processing service to make tax payments using a debit or credit card, this will involve an additional fee. Another option is to use the Electronic Federal Tax Payment System to make quarterly tax payments online at www.eftps.gov/eftps or by calling 1-800-555-4477. This free service works by transferring funds from your checking or savings account on the date you designate. If you pay using either of these methods, you will not need to also mail in a payment voucher. Can You E-File If You Owe Taxes? To enroll, select the enrollment button on the EFTPS homepage. Provide your name, Social Security number, contact information and bank account information. After completing your enrollment, the Department of the Treasury will mail a personal identification number to your contact address. Once you receive a PIN number, you can start making payments by telephone. If you plan to make payments online, select the “Make a Payment” option on the EFTPS homepage. Enter your Social Security number, PIN number and click the “Need a Password” link. After creating a password, you can then schedule one-time or recurring online payments.